Skype for Business lets you find a previous conversation by browsing your conversation history or by searching in your past conversations with a specific person. Open Skype for Business, and in your contacts list, right-click the person whose previous conversation you want to view. 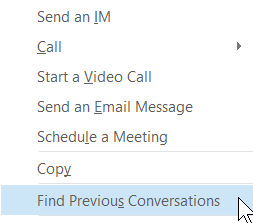 Outlook opens and displays that contact’s conversations with you in the Conversation History folder. To track down the specific conversation, enter a term or terms that would have come up in the conversation you’re looking for, in the search box at top of the Outlook window. Open Skype for Business, and, above the search box, click the Conversations tab. All your conversations appear in chronological order, with the most recent at the top. Phone calls you’ve had also appear on the conversations list. Missed Lists your missed conversations only. Calls Lists your phone calls only. You can also find a copy of your Conversation History in Outlook 2016 or OWA in the "Conversation History" folder.